Our family has been making some of California’s finest wines for generations. Choosing only the best fruit from the finest coastal vineyards, we strive for excellence in all of our reserve wines. The best our family has to offer. 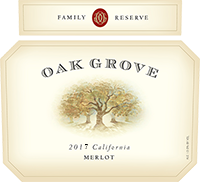 A versatile favorite, Oak Grove Family Reserve Merlot marries rich, complex flavors of blackberries and plum with a touch of black pepper while supple tannins give way to a long, smooth finish. Pair with a green peppercorn filet or savory salad to experience this wine at its best.